As might be expected, the riding mower is the really big dog on the block when it comes to lawn mowing. There is a vast array of options to consider before purchasing one of these beasts. Where to buy a new riding lawn mower? Buying outdoor power equipment isn't as simple as it used to be. There are a lot more choices and a lot more people who will gladly sell you a tractor or riding mower. Unfortunately, not all of them are prepared to provide one extremely valuable commodity... knowledge. There's great value in having a dedicated professional answering your lawn mowing questions, making sure you make the right choice and providing years of follow-up service. It's something you just can't take for granted. Consider the four important qualities - cutting ability, traction, reliability and ease of use. These are the attributes, too, that will help you purchase a product based on its ability to perform and to last - not just on its price. Focusing on these things will help you remain objective in your purchasing process. The time to get emotional is after you've owned your tractor for many years, not during the shopping experience. 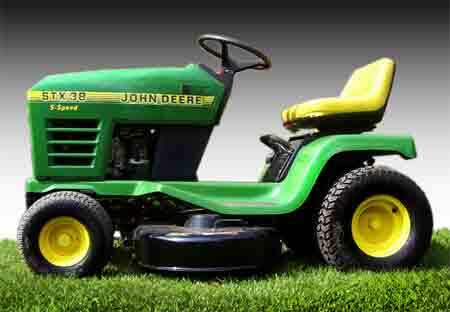 When buying a lawn mower or garden tractor, nothing is more important than its ability to meticulously mow your lawn. And the way your tractor's mower is engineered will determine whether your lawn will show off a smooth manicure, or a lawn scarred by scalping. There is a science to designing mower decks. The depth and shape of the deck determines if there is sufficient vacuum and wind velocity necessary to lift, cut and evenly distribute clippings. How the deck is suspended determines how the mower rides over your lawn. A mower deck that rides over your lawn independent of the tractor frame. It follows the lawn's contours into low areas and raises over high spots. The result? Uncut strips are nonexistent. There is no scalping. Just a smooth, green carpet that showcases your home. Front wheel diameters range from 8" - 12" and rear wheels are usually 10" - 16", but may measure in at 20". Pneumatic tires or semi-pneumatic tires are frequently used on lower-priced models. Turning radius for riding equipment is usually 32" or above, but can be as tight as 16" and you should look for both steering ease and a ruggedly constructed steering gear. Transmissions vary from one speed forward, neutral and reverse, to five speeds forward, neutral and reverse, with most models having three forward speeds. Driving speeds range from 1 - 7 mph with 3 - 4 mph is the usual operating speed. Another belt usually runs from the engine to transmission and a chain runs from the transmission to the differential. Lawns present many challenges. Some lawns have hills, drainage ditches, berms and mounds. Add rain or morning dew and you can be left spinning your wheels. You want a tractor that won't be spinning its wheels in difficult situations and possibly ruining your lawn's appearance. Lawn mower tires for riding and walk behind lawn mowers are tires which have long wearing characteristics combined with a high rubber to void ratio (more rubber than gaps). This higher rubber to void ratio helps insure that your mower is gentle on the turf, yet still provides adequate traction. Ribbed tires can also be used. With these lawn mower tires minimal turf damage is produced but there is less traction. Classic rib tires are specially designed to reduce turf damage. Excellent front end tire, sporting a long-lasting high performance rating. 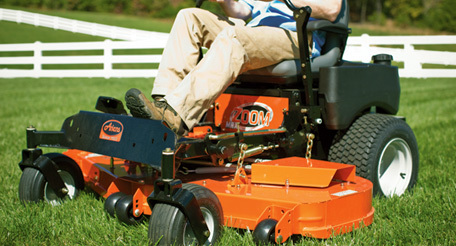 Classic TX makes it easier to mow, rugged, designed to take abuse. The classic TX has more traction than a standard tire. Wide footprint provides more stability under heavy loads. Multi Trac C/S features a unique beveled shoulder, turf friendly tread and flat footprint, making the C/S the longest wearing turf traction tire in the industry. Smooth tire used where traction is not important. Recommended for its superior puncture resistance and minimal turf damage. Is ideal for use as a front lawn tractor tire. Studded tire. Special 2-way traction for this lawn mower tire; offers versatility for use on residential riding mowers as well as some industrial applications. If you will be using the machine just for cutting grass, a riding lawn mower is fine. They have several attachment options, but don't expect it to do any heavy lifting or pulling. If you will be using the mower to pull ground engaging attachments, such as a plow, disc harrow or tiller, you will need a tractor. A lawn tractor does has multiple add-on options such as aerators, leaf-gathering attachments, wagons. A garden tractor has a heavier frame and transmission, larger rear wheels, and is also appropriate for larger mowing jobs. A garden tractor has the highest horsepower (generally 20-27 hp). Residential garden tractors can pull a tiller, cultivator, thatcher or other ground-engaging tool behind it, but to do so they need more power than typical lawn tractors. Lawn tractors typically range in retail price from $1000 - $5000 with the most popular models sitting between $1500 and $2500. Garden tractors range from $2000 to more than $9000 with the most popular models in the $2500 - $4000 price range. Best deals for buying a lawn / garden tractor? Buy during the off-season. That means fall / late fall. Most pieces of lawn equipment are spring and summer tools-- so they don't sell all that well in the fall and winter. Shop around. Prices can vary by 100s of dollars from store to store for the same same model! Compare prices at 3 - 4 stores and save. Look for "last year's models". Again, just like cars, lawn tractor styles and models change from year to year and stores must move their old inventory to make space for the new. This usually means deep discounts. Haggle over the sticker price. Bring competitive prices and ask managers to beat them. Haggling has never been a strong tradition in America, but it is still worth a try. You have to know what you're buying, what the competition is offering compared to what your salesman is offering. Know what is included in the price: annual checkups? oil changes? Offering cash instead of credit cards might get you a discount. Sometimes crying helps. When the sales mentions the price, just say "wow... and repeat the price" don't saying anything more.